Your business demands the strength and precision of roll formed parts. The roll forming machinery (also known as a roll former, see right) at Roller Die is engineered to form each shape or component you require. Whether manufacturing appliances, highway safety barriers or solar panel mounting systems for customers, Roller Die depends on roll forming machines to get the job done right. Roller Die’s roll forming facilities contain several roll former systems, enabling us to manufacture parts of any length. Our engineers are expert operators, using these machines to create superior metal parts. Our systems are accurate, dependable, and efficient – so we can pass the quality and savings to you. 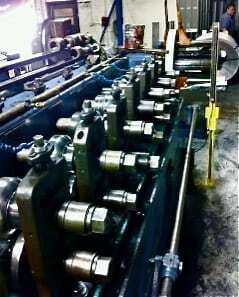 Your business demands parts from state-of-the-art roll former machines. Let’s get started: request a quote from Roller Die today.